IPM 1 Fighting Varroa 1: The Silver Bullet, or Brass Knuckles? After we’ve passed through these five stages, we have a chance at Recovery, which in this case, is coexistence with the mite, with bees bred for handling the mite on their own. We went through Denial when we first saw the mite in the ‘90’s (although many beekeepers seem to keep falling back to this stage!). We experienced Anger as we watched colonies collapse by the thousands with PMS (parasitic mite syndrome), and angrily fought back with the fluvalinate “silver bullet.” The mite even looked to be manageable for a few glorious years while Apistan® worked. Unfortunately, the mites resurrected by becoming resistant, and we Bargained with scary-smelling CheckMite®, essential oils, and every imaginable desperate “home remedy.” By the turn of the century, many beekeepers faced Depression, and threw in the towel. Unfortunately, I still see many beekeepers stuck in Stage 3, placing all their bets on whatever current, or future, Silver Bullets the chemical industry offers up. The Europeans, however, and a number of successful U.S. beekeepers have taken the more “mature” view of Acceptance, in which we settle in for a prolonged fight until we achieve Recovery. During this fight we need to make a difficult transition while weaning ourselves from Silver Bullets. This transition involves a multicomponent “Brass Knuckles” approach to keep the mite in check, while we train the “Bee Brigade” to take over the task by themselves. There are a few brave souls who appear to have already reached the Recovery stage by selective breeding and effective management, and are able to keep their colonies alive with no treatments at all–I see them as the future of the industry. This article is targeted to those of us who have reached Acceptance of the mite but have not yet achieved Recovery. The “Silver Bullet” or Brass Knuckles? Paradigm 1–The Silver Bullet approach: stay on the chemical treadmill, beholden to the chemical manufacturers. Always skirting disaster, which will occur when the mite evolves resistance to whatever miticide(s) you are depending upon. In addition, honeycomb absorbs chemicals like a sponge, and our bees wind up living in a toxic stew. The general argument for this strategy is that it is cheap (in the short term) due to low labor costs, and no new equipment or management changes are necessary. One big problem with this paradigm is that many beekeepers don’t have a fallback “Plan B” in place should their current Silver Bullet fail. Two of the first “Silver Bullets.” Since these miticides only target specific nerve chemistry, the mites are able to rapidly develop resistance. The other problem is that both chemicals contaminate your combs with harmful residues. Paradigm 2–The Brass Knuckles approach: This mite is one tough bugger, and it’s here to stay. If my bees and I want to survive, we’ve got to put on the brass knuckles and learn to fight it hand-on-hand. I’m going to learn all about my enemy, and make its life miserable at every turn. I’m not aiming for a complete kill, only to keep its population to an acceptable seasonal level. I’ll use every weapon at hand, except comb- or honey-contaminating “nuclear weapons.” Mind you, this is only a transitional approach as we, and the mite, apply selective pressure upon the bees to do the job themselves. Luckily, the Brass Knuckles approach allows the beekeeper to take a fallback position at any time. To prepare this article, I scoured the research from Europe, Canada, New Zealand, the U.S., and other countries, as well as interviewing successful beekeepers, and trying most of the methods myself. The research is fascinating, and often contradictory. We all are dealing with similar bees, and similar mites, but each country and region tends to take a different tack. Plus, it’s often difficult to reconcile theoretical conjecture, cherished opinions, laboratory results, proprietary claims, and practical experience. I have tried to distill out only those methods which have proven effective in controlled trials and practice. Since the Brass Knuckles approach is one of engaging in a “long war” with the mite, I’ll add a little levity by using military terms for my headings. The European honey bee has not yet reached a stable relationship with its relatively new parasite, the varroa mite. In a typical, untreated colony, the mite level is at its lowest point about Christmas time. The mite population increases through the spring, reproducing especially in drone brood (a key point to remember). The colony generally tolerates the mites during this time, since the bees are reproducing faster than the mites, and drone brood is more expendable than worker brood. 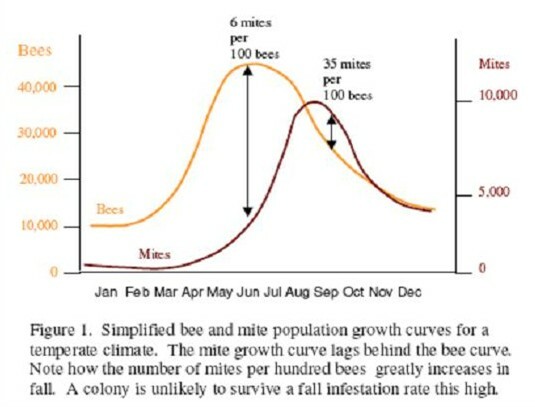 Then in late July or August (depending on your area) three things happen: the bees stop raising drones, they cut back on brood rearing, and the mite population peaks. At this point in time, there are a large number of mites relative to the small amount of worker brood to parasitize, and the developing workers are either killed outright, stressed to the point that they are susceptible to viruses (especially Deformed Wing Virus), or too weakened to become productive workers. Unfortunately, this is the generation of workers that must support the colony through winter. 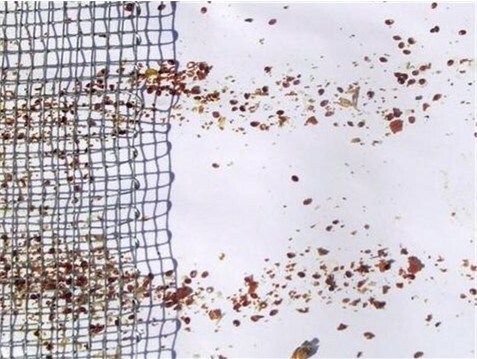 The result is that the Varroa-stressed colony collapses sometime between fall and early spring. Commonly, the beekeeper observes an active colony in the fall, then some weeks later, there are absolutely no bees, and an abandoned hive full of honey. To make matters worse, as the colony collapses, other colonies will rob it out, and in the process carry mites back to the robbing colony—this is the main mode of dispersal of the mite to new colonies (Goodwin 2006). I’ve misplaced the source of this graph. If anyone knows, please email me. In preparing for our brass-knuckled assault on our enemy, we must know its weak spots (I’ve put them in boldface). Unfortunately, during the period that mite populations are building, about two thirds of the mites at any time are safely hidden in sealed brood, protected by the silken bee pupal cocoon. Only a few volatile miticides can penetrate the cocoon—notably formic acid and thymol. In the process, however, these two treatments also kill a percentage of the bee brood. So, other than using a cocoon-penetrating fumigant, we must hit the mite when it is most vulnerable—in the “phoretic” (hitchhiking) stage. There are two times to do that: when the colony is broodless (during winter, or made broodless by manipulation), or when the mite is feeding on adult bees prior to entering a cell. Here’s the biology: a female “foundress” mite enters a cell when (or just before) the bee larva is in the propupal stage, but before it spins its cocoon. This occurs about day 8-10 after the bee egg is laid. The foundress mite and any mature daughters emerge with the adult bee on day 21 (if the bee survives until then). Therefore, the mite is hidden for only about 10-12 days. The adult female must then spend from 4 to 15 days sucking the blood of adult bees (usually on nurse bees in the brood nest area) before she is ready to enter a cell and start egg laying. A female mite can live for 3-4 breeding cycles. Reproductive success averages roughly 1-2 viable offspring in worker cells, and 2-3 in drone cells. Because of this low rate, in order for the mite population to increase, female mites must invade a cell and reproduce more than once during their lifetimes. Most all methods of beating up the mite focus on its vulnerability during the phoretic stage. 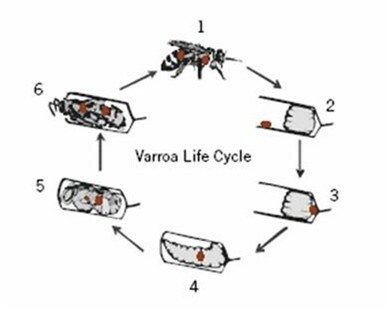 The varroa life cycle takes about 11-12 days in the cell, then several days in the phoretic stage on adult bees. Credit needed. One other aspect of mite biology is of note: the foundress mite is more attracted to, and successfully rears more offspring in, drone brood than in worker brood (on its natural host, Apis cerana, the mite reproduces only on drone pupae), due to the drone’s larger size and longer developmental period. We can use this fact against our enemy. Another biological aspect of varroa worth noting is its amazing ability to quickly develop genetic resistance to chemical miticides (at least the synthetic ones that have only one mode of action). Once in a cell, the foundress mite lays a male egg first, then female eggs thereafter. The male mite mates with his sisters, and dies when the cell is opened. This inbreeding locks in successful genetic mutations that might have allowed a particular foundress mite to survive a chemical treatment. You may have noted that I have not discussed our allies in this battle–the bees (who have a vested interest in surviving). I will cover their contributions further along. 3. Kill colonies, rather than coexist with them, since colonies that collapse best disperse mites. In other words, we’ve been inadvertently selecting for the most virulent, rather than the most benign mites. One could argue that it would be better to change our strategies to reverse the above selective pressures, and promote mites that are less virulent, and that can coexist at a low level in our colonies. First, you don’t have to fight the mite single-handedly. There are bees out there with the genetics to fight the mites themselves—they’ll just need your help sometimes. I’ll talk about these fightin’ bees in Choosing your Troops. VSH (Varroa Sensitive Hygiene) breeder queen. 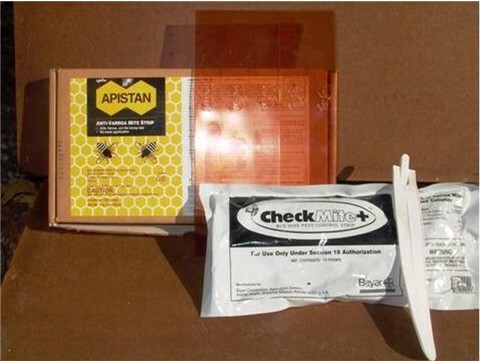 This line was developed by the USDA Agricultural Research Service to fight varroa. Breeder queens are available from Glenn Apiaries. Photo Glenn Apiaries. Second, stop freaking out if you see a mite! 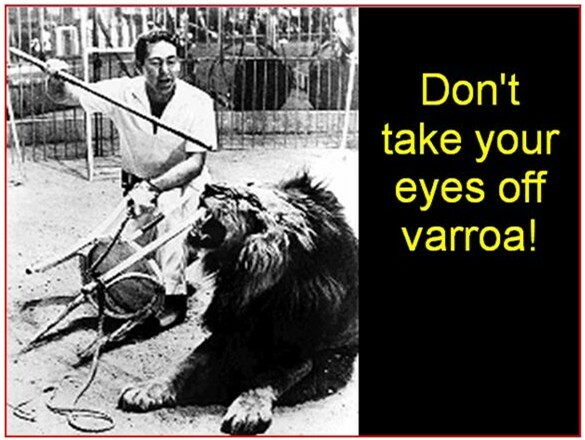 Understand your enemy, so you’re not irrational with fear. The bees can handle a certain level of mites fairly well. Find out for your area, just what load of mites your colony can safely carry at any time of the year. The level that starts to hurt the colony is called the Economic Injury Level. So monitor your mites to make sure they stay below that level. If the mites are at a lower level, relax–you can sleep at night. However, if they are starting to approach injury level, start hitting them “softly.” Only if they are over that level would you consider hitting them hard with some sort of strong chemical (you want to save your strong chemicals like a pistol in your back pocket, just in case things start to get out of hand). I’ll cover monitoring under Reconnaissance. The author inserting a sticky board to monitor mite levels. Other monitoring methods are more accurate in the short term. A typical sticky board after a day or two. The mites and hive trash fall in lines between the frames, and mites are often mostly in one area. The 1/8” screen keeps the bees from removing the mites. Third, let’s make it generally miserable for the mite to survive, reproduce and disperse; and do all we can to help our bees fight the mite on their own. These tactics fall under Biotechnical Methods. One biotechnical method is trapping mites in sacrificial drone brood. 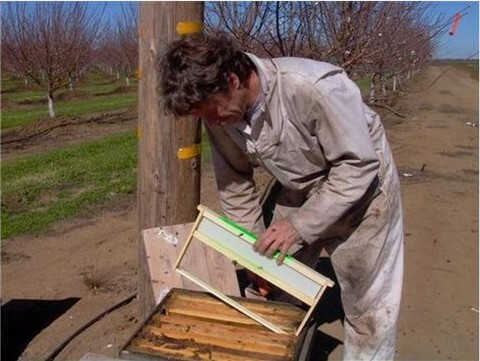 I’m inserting a drone trap frame in February in an almond orchard. Fourth, now that you’ve done the first three steps, that may be all you have to do to maintain a “truce” with varroa! Unfortunately, most of us will still have to keep fighting. The next step in IPM is Soft Treatments, i.e., chemicals that kill a moderate proportion of the mites, are gentle on the bees, and unlikely to contaminate the combs. 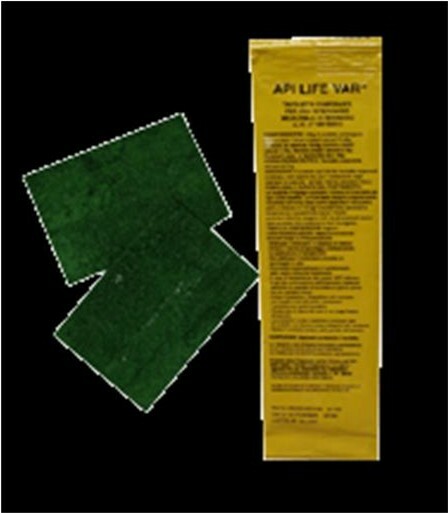 ApiLife Var was one of the first “soft” treatments. It’s main active ingredient is thymol, along with eucalyptol, menthol, and camphor. Fifth, if soft treatments still haven’t done the job, and you need to do something drastic to keep your colony alive, then pull out a Hard Treatment. The temptation may be to just go straight to hard treatments each year, but in the long run that would just put us back on the Silver Bullet treadmill, since the mites will likely develop resistance to any hard treatment used yearly. So we will use hard treatments sparingly. I realize that by using the battle metaphor to describe the situation with varroa, that I’m anthropomorphizing the mite. In reality, the mite is a non-thinking automaton—a very effective little robot with a simple hardwired program. At the individual level, no “learning” (change) takes place; but at the species level, it can change by small increments in its behavior, morphology (structure), or biochemistry through the process of mutation or gene recombination. The honey bee is much the same—a generally nonthinking robot that follows simple behaviors. For example, most bees in the U.S. don’t possess the gene for the behavior to bite mites; when that gene becomes more prevalent in the population, we will say that the bees “learned” to bite mites. The “learning” didn’t occur in any individual bee—it occurred in the species by genetic change. The only player in this battle with the ability for cognitive thought is the beekeeper (although, at times, many seem to be devoid of that valuable attribute!). We should really describe the situation as a battle of robots, led by two very different generals. The mites’ general is the mathematical hand of natural selection, promoting only those soldiers who are effective at survival. That survival could take the form of the benign coexistence the mite has with Apis cerana, or the form we have driven it to—rapid population recovery, kill the colony, then spread through robbing. The bees, on the other hand, have a democracy of generals—the hand of Nature, plus thousands of beekeepers, who, unfortunately, aren’t about to cooperate in a common battle plan. If we beekeepers could manage to see the “Big Picture,” and collaborate with the force of natural selection, then we could come to a long-term truce with the mite. That said, let me return to the battle metaphor, and discuss the little mite-robot’s hardwired tactics program. 1. It hides in the brood (where it’s hard for us, or the bee, to hit it). 2. It inbreeds, which lets it quickly lock in miticide-resistance mutations. 3. It reproduces relatively slowly, but exponentially, especially in the drone brood. (A weakness: this requires female mites to invade cells multiple times, and thereby expose themselves). 4. It spreads by weakening or killing the colony so that it can hitchhike on robber bees to infest new colonies. 2. There would be little “pressure” for the mite to adapt to any one particular threat, since enough mites survive each punch that change is not worthwhile. 3. Remember that varroa peacefully coexists with Apis cerana, and evolved to become less, rather than more, virulent to its original host. So our model is not to exterminate the mite, but rather to just keep it subdued. Many beekeepers have fallen into this trap—you figure out a great seasonal strategy that gives you good mite control for two years in a row. You pat yourself on the back, and lean back in your easy chair, proud of your “victory” over those dumb mites. I’ve got news for you—the mites never relax. The next year (or the next) those mites come back with a vengeance, and bam!, you feel like you’re back on Square One. Join the crowd—we’ve all been there! So what do I mean by “Do not become complacent?” Beekeeping was “easy” in the Good Old Days before varroa. You could figure out a seasonal management system, and repeat it successfully year after year. No more—now you’ve got to spy on the mite regularly, both at home, and elsewhere. Keep abreast of what it’s doing in the next state, because it will soon be doing it in your apiary! Monitor mite levels regularly. Some years mites will have low populations for no apparent reason; other years they’ll roar into battle like a horde of Mongols. You’ve got to be ready to adapt. More importantly, be proactive, and keep one step ahead of them (easy to say, huh?). Now, you may wonder, what strategy am I going to suggest for you to use? The answer is, I’m not! There are several reasons for that statement. First, I have no illusions of being The World’s Greatest Beekeeper—in fact, my operation has crashed regularly in my various skirmishes with the mite. Second, I’m in the running for the title of being The World’s Worst Businessman, so I’m not about to tell anyone how to run a profitable business. Third, an IPM strategy will be different for every level of beekeeper–hobbyist, sideliner, or commercial operator. And fourth, if we all do the same thing, varroa will figure out our strategy, and beat us at our game! That said, the Europeans, who have had the mite much longer than us, have come to the conclusion that IPM is the only way to go (they also tend to run small, labor-intensive operations). I will list a number of useful papers and manuals available on the Web at the end of this series of articles. For the hobbyist, with isolated small beeyards, and the ability to spend a little time with each colony, “organic” IPM is clearly the way to go, and he/she can then charge accordingly for their honey. The sideliner (which is the most difficult way to keep bees, since your “day job” pulls you away from critical beekeeping tasks), is going to need a labor-effective strategy. The Big Boys, with thousands of colonies, are likely going to resist change until the mite wrests the last Silver Bullet out of their cold, dead hands. Just kidding; I said “resist change,” not that they won’t change. The reality is, there is little incentive for them to change, as long as they can keep their bees alive with inexpensive Silver Bullets. Change involves risk, and extra costs during the “learning curve.” It generally pays a large operation to act conservatively, and follow someone else’s success. 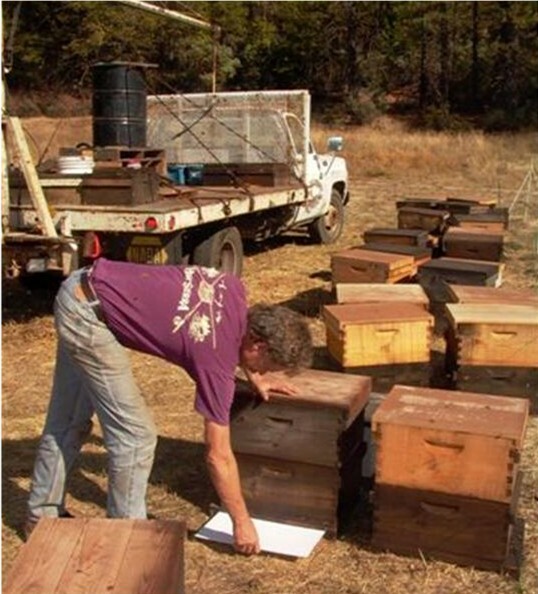 A notable exception is B Weaver Apiaries, who bit the bullet and gave up all miticides ten years ago (http://www.beeweaver.com/home.php?cat=1), yet are still running a successful operation. Some queen producers are changing, due to the problem of chemical buildup in their combs hampering queen rearing. Other cutting-edge commercial operators are embracing a new model, and making forward-looking 5-year plans that incorporate IPM. Overall, I see the Industry moving, albeit slowly, in the right direction. Keith Delaplane (2005) recently published an article as to the economic viability of a multi-component IPM approach. If you are successfully practicing IPM, please share what you’ve learned with the rest of us! Commercial operators: please don’t pooh-pooh this as some kind of ivory-tower pie-in-the-sky wouldn’t-it-be-nice-if pipedream! IPM is a sharp-pencil bottom-line-driven business decision that can put cold, hard cash in your pocket, and keep warm, healthy bees alive in your boxes. Indeed, IPM has been successfully embraced worldwide by many branches of agriculture. If you’re still dragging your feet, I can understand: Everett Rogers (1962 stated that adopters of any new innovation or idea could be categorized as innovators (2.5%), early adopters (13.5%), early majority (34%), late majority (34%) and laggards (16%), based on a bell curve. Each adopter’s willingness and ability to adopt an innovation would depend on their awareness, interest, evaluation, trial, and adoption. We owe a great deal to the innovators, who are willing to try something new, often crash and burn, but then get up and use what they’ve learned to forge on. Where would you place yourself in the above list? 4. Implementation – putting it to use. 5. Confirmation – the person evaluates the results of an innovation-decision already made. OK–in this series I’m going to give you enough knowledge to get you started. I’m obviously trying to persuade you. It’s up to you to make the decision, and go through with the implementation! The main impediment to moving our industry towards IPM is the uncertainly felt by beekeepers that it will indeed both work, and be more cost effective than the practices they are currently employing. The “tip point” will come when enough Early Adopters confirm its success that the majority will embrace the change as a sound business decision. Right now, I call upon you venturesome types to join me in the next stage of recovery from varroa mite trauma. 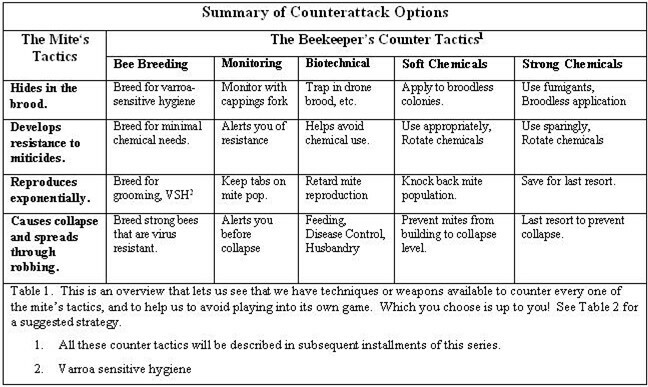 Following is a sample IPM plan for beekeepers in my area. I’m not expecting you to copy it exactly, but rather to use it as a starting point from which to develop your own plan. Luckily, you needn’t risk all–one of the beauties of IPM is that you can start implementing it one small step at a time, without having to take the risk of jumping right in with both feet! Beginning next month, I will cover the various strategies, tools, weapons, and tactics in turn. 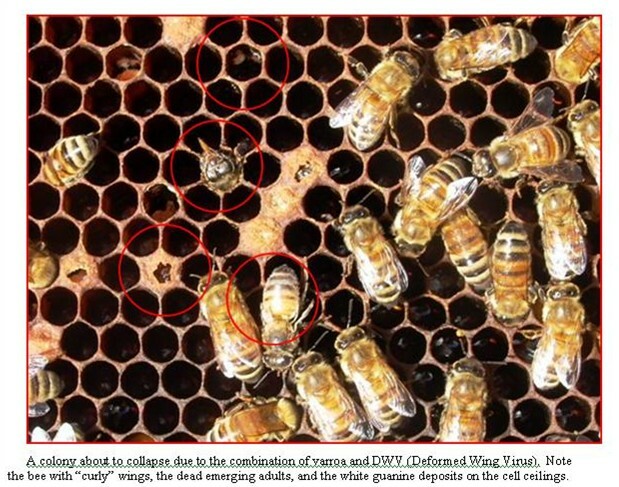 Goodwin, R M, Taylor, M A, Mcbrydie, H M and Cox, H M. 2006 Drift of Varroa destructor-infested worker honey bees to neighboring colonies. Journal of Apicultural Research 45(3): 155-156.